A swather, or windrower, is a farm implement that cuts hay or small grain crops and forms them into a windrow. "Swather" is predominantly the North American term for these machines. In Australia and other parts of the world, they are called "windrowers". They aid harvesting by speeding up the process of drying the crop down to a moisture content suitable for harvesting and storage. A swather may be self-propelled via an internal combustion engine, or may be drawn by a tractor and powered through a power take-off shaft. A swather uses a sickle bar (see mower) or cutting discs to cut the stems of the crop. 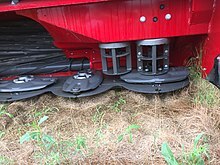 A reel helps the cut crop fall neatly onto a canvas or auger conveyor which moves it and deposits it into a windrow, with all stems oriented in the same direction. Horizontal rollers behind the cutters may be used to crimp the stems of the crop to decrease drying time. The mown strip left behind is the swathe. For hay crops, this is the same basic sequence as also done in other ways, such as hand scything, cradling, and swathing; mowing with a mower and then raking with a hay rake; or mowing and conditioning with a mower-conditioner (the latter two sometimes also with additional tedding). But for grain crops, as combines replaced threshing machines, the swather introduced a new step in the harvesting process to provide for the drying time that binding formerly provided for. Binding allowed subsequent temporary storage of the cut plants before threshing (either in stooks or in a barn), during which time they dried out. Combining removes the binding step and the temporary pre-threshing storage step from the harvesting process, but in many regions of the world, combining without a preceding swathing step, that is, reaping and threshing a standing plant all at once, produces threshed grain that is too high in moisture for reliable storage. Getting around that problem drove the development both of swathing practice for grain crops (1920s–1930s):212–217 and of widespread industrial-scale grain drying (especially after World War II). 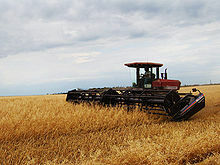 Swathing (windrowing) is more common in the northern United States and Canada because the curing time for grain crops is reduced by cutting the plant stems. In regions with longer growing seasons, grain crops are usually left standing and harvested directly by combines. The difference is that in the latter regions the grain can reliably reach low enough moisture while still on the standing plant, whereas in the regions less conducive to such drying, swathing provides the extra help that is needed to reach low enough moisture. Regardless of which harvesting methods are used, threshed grain can receive additional drying, or not, as needed for storage; the ideal in efficiency (that is, in energy efficiency, person-hour and machine-hour productivity, and thus cost-effectiveness) is to produce grain that is dry enough as-is right out of the combine. But reality does not always match this ideal, in which case a damp harvest followed by drying is much better than no harvest. For farmers who do not have their own grain drying equipment, usually the grain elevator company that buys the grain will do the drying and pay its expense by docking some percentage points from the price paid for the grain. The Swather is the mascot of sports teams at Hesston High School in Hesston, Kansas, USA. Hesston is the home to AGCO Corporation's large swather and combine harvester manufacturing plants. ^ McCormick, Cyrus Hall, III (1931), The Century of the Reaper, Houghton Mifflin, LCCN 31009940, OCLC 559717. ^ Rhodes, Richard (1989). Farm: A Year in the Life of an American Farmer. New York: Simon & Schuster. ISBN 0-671-63647-2.